A French song that made its way into the ears of Dutch people because one fat fellow covered it in half French and half Dutch. Well anyway, I like it. 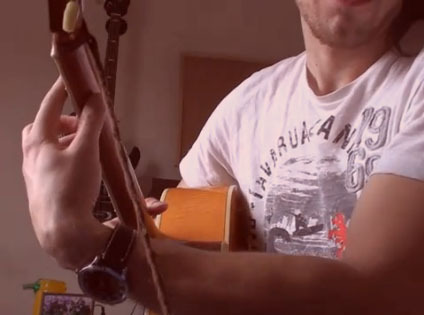 It has a nice open chord progression -together with the supposedly fast strumms- this is a great exercise to practice my left handed swiftness. As a guitar player you've got to be careful with your hands. You won't see an injury coming. There's no indicator, you just feel it when its to late (Thats what happened to me). The stretches that I show will help you prevent getting stressed muscles, tendonitis [inflammation of the tendons], carpal tunnel syndrome, and will increase stamina. I never cared about stretching and kept on playing after I was well aware of the tendonitis, eventually causing swellings and fluids to settle in my wrist joint. So be careful and stretch, even though this vid is showed in a 'fun' way, you should take it serious! Except for your flexibility and muscle strength, technique is also very important in preventing injuries. 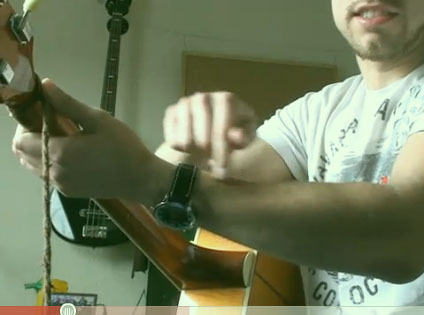 Be sure to view my vid on the right wrist position while playing guitar. And be prepared for an update vid where I'll talk about what you can do when its already to late and you developed an injury. Last of all I would like to quote Brad Hartoin, who wrote an excellent post on this subject and even goes deeper into details. The deep tissue massage is something a want to talk about at a later time. Man this song was hard, but also, so nice! Michael Bolton is really a master in song writing. I love his music. So my right hand muscles finally memorized the chords and I could play them, but I still needed 'Injured Tom' for the fast fingerpicking. So while I'm training my left handed play for not needing to play right handed anymore [in this awesome way] I also stress my wrist a lot. So I guess its gonna take a while before I do something like this again. Prolly when I don't need the right-hand guitar anymore.. Yesterday I came up with an Idea. Actually, there where a few ideas floating around in my mind. I wanted to try a song I liked on the left handed guitar, I thought about using the capo. It's also been a while since I played something new on the harmonica. I even got a mail from someone on youtube asking me to record another song with the harmonica :)! I transposed to song to C-Major. The chords are: C-Am-FM7-C(+highG). Tom regular started fingerpicking the chords, while Tom Lefty stroke the chords at each first count. At the chorus Tom regular starts to strum the barred chords while Tom Lefty does some 'pulling on the strings' lol. The day after I started the blog I shot a vid of the exercises I'm currently working on. I've got one exercise to prepare myself for barred chords (a bit early but **** it).One exercise to practice on plugging the strings and one exercise for fingerpicking. And fortunately (for an increase in fun-factor) it are all riffs from songs that I like! Btw I think thats something every guitar teacher should do. Pick some populair songs as soon as you can. I know guys that are playing the guitar for 6 months and still havn't learned a single song. Having fun is what its all about isn't it? I can't wait to see my progression next month or so. I used this tune in Bubbly to practice my guitar plugging. This is an A Major 7th chord. There is a difference between an AM7 and an A7! Wanna learn where the names come from? Check this blogpost (soon). Go straight to 2:45 for the background track! I show some awesome pictures while the track plays. This is the second exercise I started working on. Switching Am to C, back to Am and to Em. Giving the pinky a workout. How to read the chord diagram? Hey, my name is Tom. Since last month I started to learn myself how to play the guitar left handed. I also started a blog. You can take a look around if you want. I'm posting progression, vids, sometimes lessons or just funny music compositions. Anything to keep me busy and keep my motivation high! You've got a blog or website that's related to guitar playing or anything lefthanded? 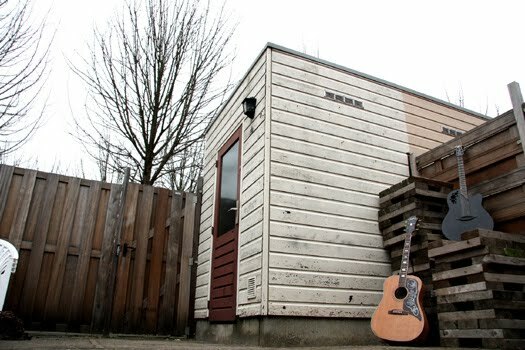 If you are a left handed guitarist and got a story to share, you can also email me and we'll have your story on the blog. 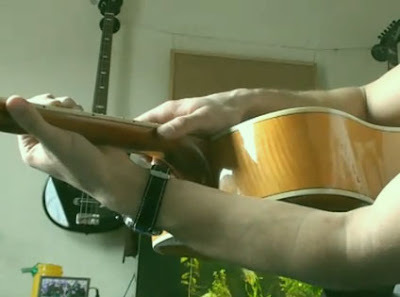 Leftys have come up with a variety of styles to play the guitar. Which way to pick?